Normally, when you make a reference to a cell that is empty, Excel will show zero inside this cell. It’s usually helpful, so you know that there is an Excel function and not a blank cell. And after you press enter, you get the following result. 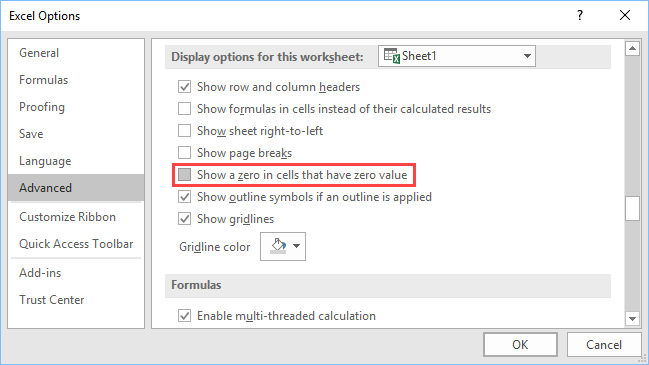 There is a way you can get a blank cell, instead of zero in Excel without using conditional functions or even VBA code. What you need to do is to change the following settings. Go to File >> Options >> Advanced and search for Display options for this workbook and uncheck Show a zero in cells that have zero value. Let’s try the same example again. Inside cell B2 you have a reference to a blank cell A1, and the result is blank.